As an elementary school student during the 1990s, I’m very nostalgic toward the Sakura Gelly Roll pen. 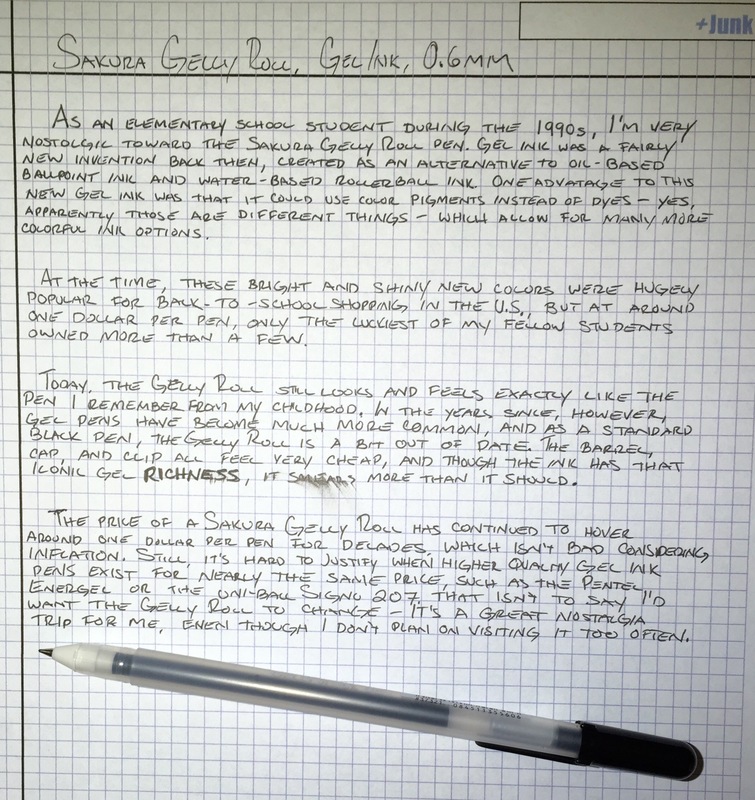 Gel ink was a fairly new invention back then, created as an alternative to oil-based ballpoint ink and water-based rollerball ink. One advantage to this new gel ink was that it could use color pigments instead of dyes – yes, apparently there’s a difference – which allow for many more colorful ink options. At the time, these bright and shiny new colors were hugely popular for back-to-school shopping in the U.S., but at around $1 per pen, only the luckiest of my fellow students owned more than a few. Today, the Gelly Roll still looks and feels exactly like the pen I remember from my childhood. In the years since, however, gel pens have become much more common, and as a standard black writing pen, the Gelly Roll is a bit out of date. The barrel, cap, and clip all feel very cheap, and though the ink has that iconic gel richness, it smears more than it should. The price of a Sakura Gelly Roll has continued to hover around $1 per pen for decades, which isn’t bad considering inflation. Still, it’s hard to justify when higher quality gel ink pens exist for nearly the same price, such as the Pentel Energel or the uni-ball Signo 207. That isn’t to say I’d want the Gelly Roll to change – it’s a great nostalgia trip for me, even though I don’t plan on visiting it too often. Sakura has a history of it’s Gelly Roll line of pens on their website. A very good read. Huge Gelly Roll color collection over at Gourmet Pens. Children of the 90s has a great write-up on the popularity of Gelly Rolls.